Having several chronic illnesses means that I unfortunately have to take quite a lot of different medications. It can be difficult carrying around lots of boxes of tablets, so this pocket pill box is an ideal solution. It fits nicely in my pocket or handbag, so it's easy to carry it with me. 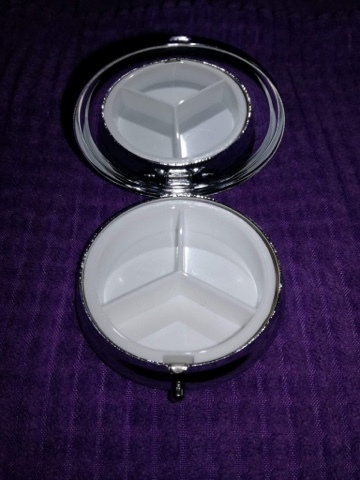 The pill box is quite small, it only measures about two inches across, but it fits a surprising amount of tablets in it. I've managed to get eight tablets comfortably in there. There are three separate compartments, so you can split your tablets into morning, noon and evening doses. To open it you have to push the button in, which I was able to do even with my arthritic hands. It's actually a great feature because it can't open accidentally in your bag. 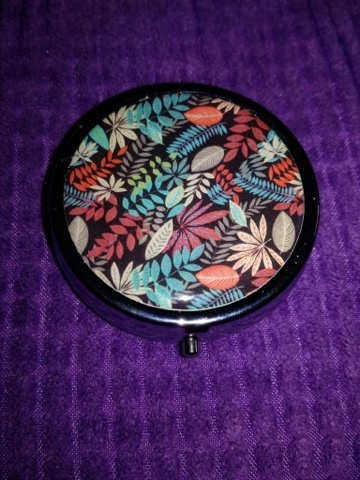 I love the pattern on the lid, it's really pretty. It's also available in a number of different designs which are suitable for both men and women. The hinge feels strong and the whole box feels really well made - this is a quality item. I really recommend this product, it's just what I needed. Five stars.